Andres Manuel Lopez Obrador, who takes office on December 1, introduced Daniel Asaf to reporters at Mexico City's international airport before departing for Tepic, capital of the western state of Nayarit. Mexico: Mexico’s president elect kicked off a nationwide tour Sunday with his new head of security in tow —a restaurant owner named Daniel Asaf who will coordinate a civilian brigade in lieu of the Mexican equivalent of the US Secret Service. 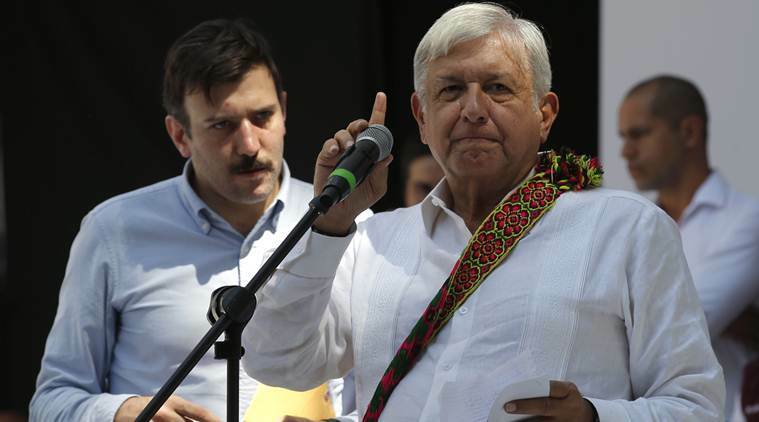 Andres Manuel Lopez Obrador, who takes office on December 1, introduced Asaf to reporters at Mexico City’s international airport before departing for Tepic, capital of the western state of Nayarit. He said Asaf will organize 20 civilian assistants who will accompany him five at a time so that he can interact with voters without getting squashed. His head of security between 2003 and 2011 was Polimnia Romana, a veterinarian who assembled a small group of female police to handle crowd control. The female force’s light touch with children and women who approached Lopez Obrador earned them the nickname “the gazelles”. Mexican presidents are only eligible to serve a single six-year term. The country’s constitution spells out various succession plans should a sitting president be incapacitated, depending on his time in office. Interim leadership could fall to the interior minister or head of the Senate until general elections are held again. Mexico is a dangerous place for politicians. More than 145 politicians _ most local figures _ have been killed in Mexico over the past year. Mexican security experts say Lopez Obrador is taking on too much risk. They point to this month’s stabbing on a crowded street of Brazilian presidential candidate Jair Bolsonaro and to the 1994 assassination of Mexican presidential hopeful Luis Colosio as proof that you never know who might have murderous intentions. Alleged assailants in both cases have been painted as lone wolfs acting out of mental instability and disagreement with the politicians’ messages. Lopez Obrador is “playing with fire,” said Alejandro Schtulmann, president of the Mexico City-based political risk firm EMPRA. Security analyst Alejandro Hope said the low-key civilian detail makes it “easier” for someone to harm the incoming president, whether he’s visiting violence-torn rural areas or congested cities. Many Obrador supporters, though, are also concerned for his safety. The incoming president has vowed to tackle corruption, which could pit him against powerful vested interests that some fear might seek to harm him. Myrna Manjarrez, a teacher who applauded Lopez Obrador in Tepic, thinks his personal security plan is dangerous but doable with the help of regular Mexicans. “It can work because he’s a person who is very attentive with the public. He’s a likeable person,” she said. Bernardo Narvaez, a retiree who attended the rally, hopes Lopez Obrador changes his mind and incorporates professional bodyguards once he becomes president. “He and the people close to him should find a way to take care of him and protect him as much as possible,” said Narvaez.